At the ancient settlement of Aşıklı Höyük in central Turkey, archaeological evidence suggests that humans began domesticating sheep and goats around 8450 BC. These practices evolved over the next 1,000 years, until the society became heavily dependent on the beasts for food and other materials. 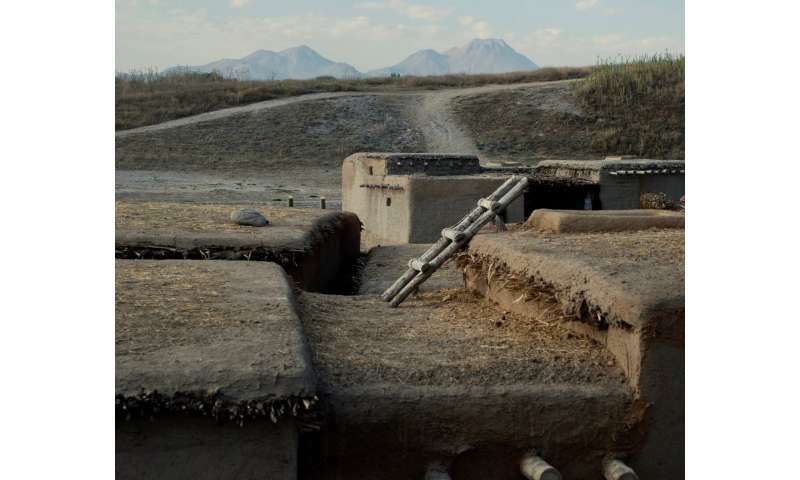 As it happened, co-authors Susan Mentzer from the University of Tübingen and Jay Quade from the University of Arizona, where Abell worked on this project as an undergraduate, had previously documented some unusually high levels of salts around Aşıklı Höyük, and were perplexed by what they meant. Using this data and others, the new study supports the idea that the salts likely came from the urine of humans, sheep and goats. The study uses the abundance of the salts over time to track the growth of the community and its animals over a period of 1,000 years. 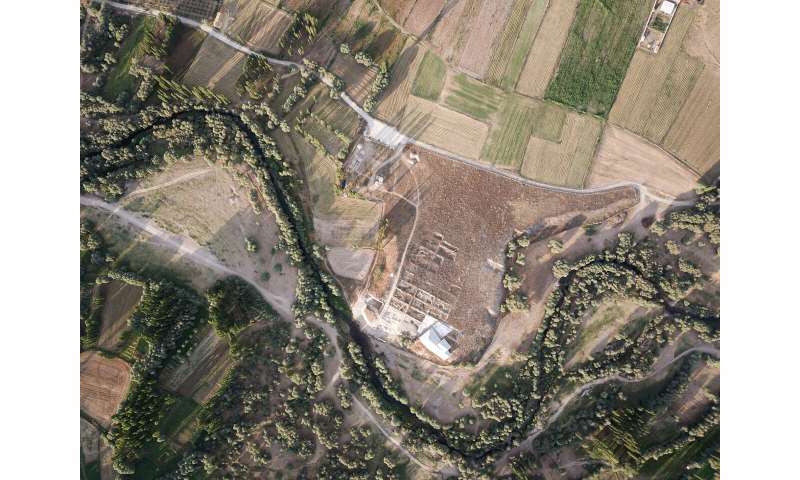 Working with Turkish archaeologists, including Istanbul University's Mihriban Ozbasaran, who heads the Aşıklı Höyük dig, the team collected 113 samples from all across the site—from trash piles to bricks and hearths, and from different time periods—to look at patterns in the sodium, nitrate and chlorine salt levels. 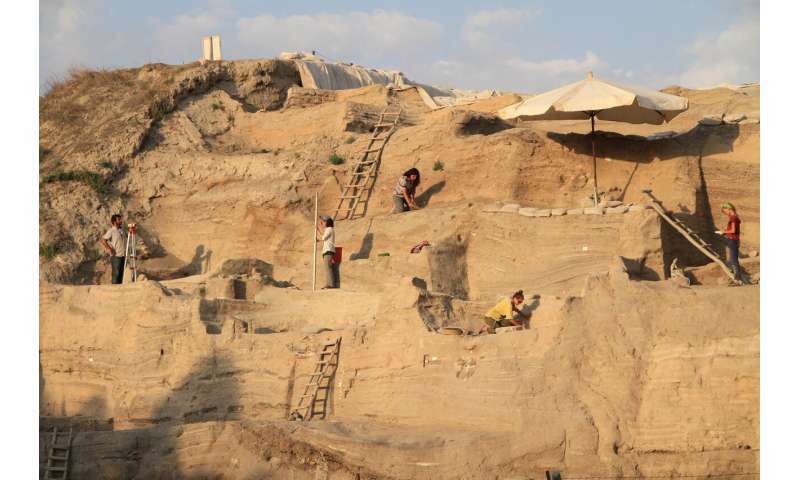 They found that, overall, the urine salts at Aşıklı Höyük increased in abundance over time. The natural layers before the settlement was built contained very low levels of salts. The oldest layers with evidence of human habitation, spanning 10,400 to 10,000 years ago, saw slight increases but remained relatively low in the urine salts. Then the salts spike during a period from 10,000 to 9,700 years ago; the amount of salts in this layer is about 1,000 times higher than in the preceding ones, indicating a rapid increase in the number of occupants (both human and animal). After that, the concentrations decrease slightly. Abell says these trends line up with previous hypotheses based on other evidence from the site—that the settlement transitioned first from mostly hunting sheep and goats to corralling just a few, then changed to larger-scale management, and then finally shifted to keeping animals in corrals on the periphery of the site as their numbers grew. 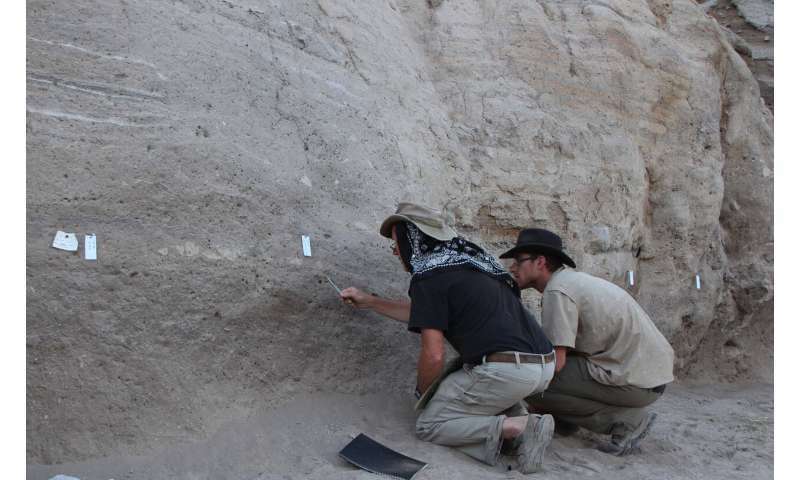 And although the timing is close to what the study authors expected, the sharp change around 10,000 years ago "may be new evidence for a more rapid transition" toward domestication, says Abell. Using the salt concentrations, the team estimated the number and density of people plus sheep and goats at Aşıklı Höyük, after accounting for other factors that might have influenced the salt levels. They calculated that around 10,000 years ago, the density of people and animals occupying the settlement jumped from near zero to approximately one person or animal for every 10 square meters. By comparison, modern-day semi-intensive feedlots have densities of about one sheep for every 5 square meters. This lends credence to the comet impact of 13,000 y ago that disrupted an established civilization, perhaps in the Caribbean. The evidence of the spread of human is the huge increase in human and animal livestock. The civilization that collapsed was a sea faring one needing sails and the only sails available were from animal material, probably wool. Farming led to flax cultivation. Did this almost same scenario occur thousands of years before? "Longships were a type of specialised Viking warships that have a long history in Scandinavia. ... with modern adaptations. They were all made out of wood, with cloth sails (woven wool)..."
-and so I learned that only one thing was not crap. -and so I learned that not one thing was not crap. My understanding is that early leather sails were replaced by lighter & stronger flax/linen & hemp up through the Classic Viking & Early Medieval Period. In turn replaced by specialty (2 layered) wool's, such as used for tapestries in the Norman Medieval Era & the Renaissance. & not a theosophist flying saucer in sight! Maybe your ouiija boards need new batteries? "the settlement transitioned first from mostly hunting sheep and goats to corralling just a few, then changed to larger-scale management, and then finally shifted to keeping animals in corrals on the periphery". "Urine, my study", my new pet pee. Youre a bot arent you? Yeah I figured. Yeah, the usual crap, seeing something that is unrelated to someone's crackpot idea (the old meme of "established civilization" isn't even fringe today, I think) and invent a pattern connection. Yawn. Vikings had wool for sure, I tracked down the first sheep in Sweden's coastal regions (or rather Baltic Sea islands) as of 6 kyrs ago, coincident with the cooler climate at the time [ http://www.storak...istoria/ ]. But flax was older and more important [ https://sv.wikipe...(textil) ], wool was likely upper/middle class material [ https://sv.wikipe...3%A4kten ]. I guess -apart from showing status - wool may had better qualities for the sails, say would have less problems with water? Or they could use the material as a jack-of-all-trades for warmth et cetera, perhaps. "That's what she said." How did you figure that? Or are you pwning my punning? Although it is not currently possible to distinguish between human and livestock urine salts, the urine salt analysis method can still provide a helpful estimate of sheep and goat abundance. Gotta hand it to them. They saw the gold lining in what would have otherwise been piss-poor research. I bought a wool 'watch cap' from a surplus store and washed it and now it wont even fit over my fist. I'm not really curious enough to look up how they dealt with shrinkage. Oh, yeah, wool that is not properly greased (lanolin) is a stinking mess when wet & shrinks right up as it dries. Well woven, piss-processed, & then lanolin coated wool cloth. Will not keep rain & sleet out entirely but that water saturation retains bodyheat. Heavy as hell but it will keep you alive in pretty bad weather. The use of wool as sailcloth depended on breeding sheep to thrive in the northern climes. Plus raising enough sheep ^ have the industrial network to produce wool-to-cloth. Then develop the 2-layer wool cloth(that sheds water) in sufficient quantities for ship sails. All this came together late in the Classical Viking period. Which is why I place it in the Norman Medieval period. As this cloth was used for the Bayeux Tapestries. This took wealth & an extensive system of investments to be possible.